Just a word of caution though, what you are about to read, cook and eat, has pretty much nothing to do with any Salade Niçoise you’ve had in any restaurant (unless you’ve been to Nice J). Not trying to scare you away or appear arrogant towards all the great restaurants featuring this dish, but sometimes I do wonder if any of the chefs ever took the time to actually check what this recipe is about. 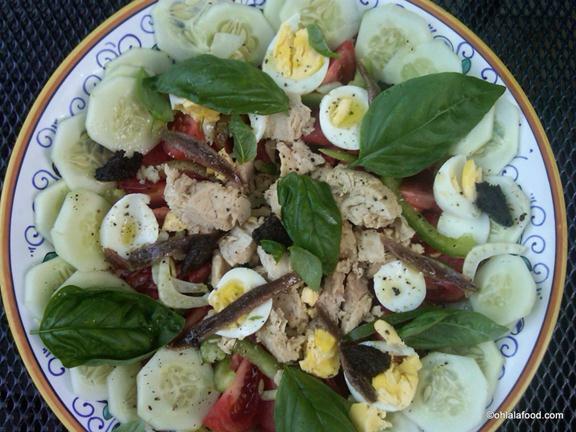 I grew up in Nice and believe me when I say that this salad goes way beyond gustatory pleasure. It is not only a statement of pride, but as well of niçois spirit and identity. The niçois language is still taught at school as a second language and if you roam around the Old Town of the city of Nice, you can read all the street names in niçois and hear a few Niçois talking to each other in something that resembles both Italian and Spanish, but is in fact Niçois language. Historically, this recipe evolved around the availability of fresh produces (tomatoes, radicchios, cucumber, green onions, cubanelle sweet pepper, celery, purple baby artichokes, niçoise black olives, broad beans) and the fact that in the hills above Nice where fresh fish was not always available back in the day, people tended to use tuna and anchovies preserved in olive oil and salt. To add protein to the dish, cooked eggs are to be found as well. SO NO COOKED VEGETABLES!! I REPEAT, NO COOKED VEGETABLES!!!! My husband makes fun of me because I’m always about to jump at waiters’ throats every time I see Salade Niçoise ingredients on menus containing cooked green beans, or worse, cooked potatoes. AARGH…WHAT A HERESY!! While UNESCO declared French cuisine a ‘world intangible heritage’ in 2010, a Nissarda Cuisine designation had been created in 2000 to protect original recipes of Nice. The label is given to restaurants respectful of the Niçois heritage. The “Circle of the Gold Capelina” organization is protecting the label. Now you understand the Cultural importance of this recipe. Ohlala!! Go try it now!! So here it is: Preparation Time: 25 minutes You need a large presentation bowl (like a pasta bowl) or a very large plate, depending on the size of your party. 4 to 6 filets of anchovies preserved in olive oil. I suggest this brand if available around you, Isola. First rub the bottom of your dish with the garlic, so you will only have the scent of the garlic without overpowering the salad. Sliced the tomatoes and arrange them in circle leaving a hole in the middle where you will add the tuna. Chopped ½ cup of Celery and the hearts of the baby artichokes (uncooked). Add on top of the rest. Drizzle pieces of green onions, a few broad beans and the olives. Finally decorate with fresh basil leaves and add your olive oil, salt and pepper to taste. Et Voilà!! You could add a few rocket (arugula) leaves salad before slicing the tomatoes. The raw broad beans are usually only available in the Spring in Nice so the rest of the year, you won’t see them on the salad which is totally ok. Some Niçois are still debating if it is Tuna OR Anchovies only and not both. It can actually turn into long hours of disagreement because food is passion J So I will leave the choice up to you. Personally I love them together in the salad. But it means that for the anti-anchovy people (yes I know you are out there), it is ok to omit them.